Last Tuesday evening, I enjoyed a presentation by British Museum archaeologist Dr. Kenneth Painter at Marischal Museum, here in Aberdeen. He provided an interesting and insightful theory on the origins of this Roman silver hoard, which dates from the 5th century AD. His theory was that this silver may have been used as currency to pay Roman mercenaries. Many of these pieces had been cut up, into what is referred to as hacksilver, in specific sizes and amounts. It was a very interesting and insightful presentation, though it was presented in a typical British way, in which the presenter basically reads their paper. I found the discussion much better when he departed from his paper, and engaged the audience during a question and answer session. There are many Roman hoards of silver which have been discovered all over the UK, and indeed Europe in general. 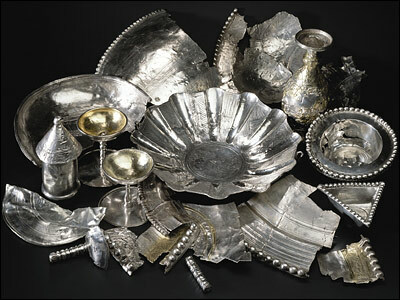 This particular hoard was discovered by excavations in 1919. The state of archeology was much different then than it is today, and not much of the context surrounding the silver was preserved and studied. However, one of Dr. Painter’s comments struck me as quite interesting. Many of these hoards are found in remote areas. This makes sense. The possessor’s of these objects wanted them to remain hidden, and so they buried their silver in the countryside. As a result, the archaeological context surrounding these hoards generally reveals relatively little. The question then becomes, would much have been discovered if a scientific dig had been conducted wherever the controversial Sevso hoard had been discovered? We’ll never know the answer to that question in all likelihood. In fact, even though Dr. Painter does not have contextual information for the Traprain silver, he at least knows the find-spot, which allows for a surprising amount of speculation, especially when this hoard is compared with others in the UK and Northern Europe. The idea occurs to me though is should there be a sliding scale for antiquities? I’m not up to date on what exactly an archaeological dig can yield, but there must be shades. If a dig is conducted in a city, surely it will reveal more information than if it took place in the countryside? Perhaps then, a case cold be made that the trade in these kinds of antiquities should be liberalized. It seems like a plausible argument, though I’m not sure archaeologists would support it. In any event, the pictures of the Traprain Silver and the other hoards Dr. Painter displayed were fantastic, and the stories and theories about how the silver found its way to Traprain law were really great. As for ‘liberalizing’ the trade in antiquities. This is already taking place with the 1996 Treasure Act, and the related Portable Antiquities Scheme. I’m sure you already know about this, but to briefly explain, it’s a way to encourage treasure hunters to report their finds, and if the finds are valuable enough, the option is given to local or national museums to purchase the object/s at market price. There are even moves to make the granting of export licences easier for objects that are reported in this way. As an archaeologist, I am in two minds about this. On one hand, it is good that a lot more finds are being reported than before, and a valuable database of information is being built. But it is still a compromise, and works on the debateable principle of ‘finders keepers’, or that cultural heritage can be privately owned. I don’t know about the history of the hoard you are describing, but I would have thought this certainly qualifies for state ownership.